This month I did not manage to finish (and submit) a journal article; I learned that I was not shortlisted for a fellowship that I had applied for, and my inbox has practically exploded. But, it wasn’t all bad news. These are some of the highlights from October. I may have failed to be shortlisted for the fellowship, but I managed to secure a travel grant to present a paper at a conference in the US, next year. So, October brought some good news on this front. The other good news is that Sarah Quinton, Thom Oliver and I concluded stage one of data collection for our Digital Citizenship project, and the recordings from the interviews are now being transcribed. At the start of the month, I also spent some time analysing student performance data, for a small project I am working on. As mentioned, I failed to finish and submit a journal article, but… I am nearly there. I have also been reviewing and editing chapters for a book that I am working on. I am very happy about the writing group, and chuffed with the publication of the book ‘Social Media in Social Research: Blogs on Blurring the Boundaries’. I have been busy teaching a market insight and consumer behaviour module to our MSc Marketing students. It’s hard word but great fun because there are so many interesting things to go over, and great examples to refer to. Plus, we have been having some amazing guest speakers, both in the class and via skype. In addition to my regular teaching, I did a session for a colleagues’ class on Sentiment Analysis. 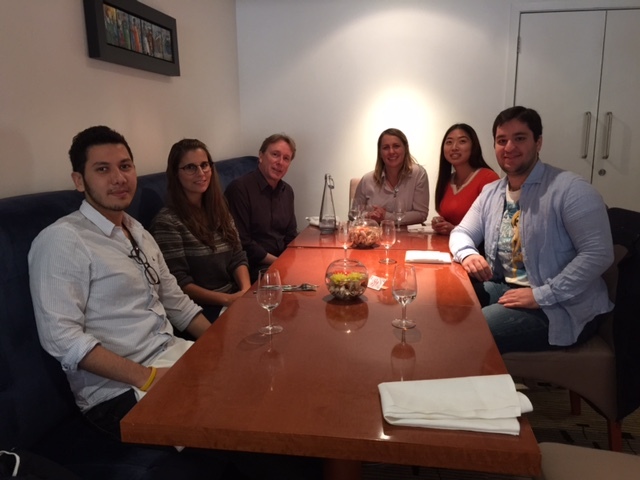 At the end of the month, my colleague Neil Brooks and I took a team of students for lunch, as a reward for doing so well in the Marketing Simulation exercise. It was really nice to celebrate the students’ success and talk with them about something other than module content or course work. It is not easy to get published in a top academic journal, in general, and it is particularly difficult to do so with qualitative research. One of the challenges is that it’s very difficult to present the findings from your study in a clear and convincing manner. So, this month, I spent some time studying the structure of successful qualitative papers – that is, studying how papers that got published in top academic journals even though they were based on qualitative research develop an argument, present the data, and communicate the key findings (e.g., how they use matrices to summarise the findings). What were October’s highlights for you? Posted on October 31, 2014 by anacanhotoPosted in PersonalTagged AcWri, Digital Citizenship, MSc Marketing, Neil Brooks, New book, Research, Round-up, Sarah Quinton, Sentiment analysis, Simulation, Social Media in Social Research: Blogs on Blurring the Boundaries, Thom Oliver.